Spray a 7-by-11-inch baking dish with cooking spray and set aside. Slice eggplant lengthwise in very thin slices—about 1/4 inch each. Add to boiling water with a quick stir. Eggplant slices will float to top; push down into water. Cook for about 2 minutes from when it starts to boil again. Drain and set aside. Mix oregano into marinara sauce, and spoon 1/4 cup of sauce onto bottom of baking dish. Place a layer of eggplant slices, as you would pasta, on bottom of dish. Cover eggplant layer with more tomato sauce, some basil, a layer of spinach, and then sprinkle some fontina cheese on top. Sprinkle with salt and pepper if desired. 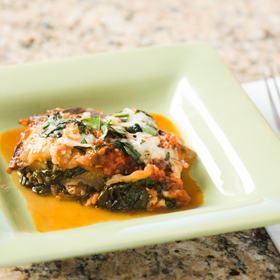 Continue to layer eggplant, sauce, basil, spinach and cheese until you reach almost the top of baking dish. The last layer should finish with both fontina and Parmesan cheese. Cover baking dish with parchment paper and then aluminum foil, and bake for about 35 to 40 minutes. Test with knife for doneness. If knife can be inserted with no resistance, uncover and bake for an additional 15 minutes until top is golden and bubbly. Remove from oven. Let rest for 10 minutes, and garnish with remaining basil. Serving size: 1/8 recipe. Amount per serving: 150 calories, 7g total fat (2.5g saturated fat), 19g carbohydrates, 7g protein, 7g dietary fiber, 151mg sodium.